Great food. That's all we want to do. We didn't set out to change the world, or want to become the next big thing. We just really want to make great food. Food that would bring together friends, family, and guests. Because what better way to spend time together, than over a great meal. From always using fresh salmon, to our homemade sauces, to using fresh, hand-battered, made-to-order wings. It's not always easier, but it's always that much better. Great food. That's our mission. California Roll, Spicy Tuna Roll, Tempura Roll, we've had it all haven't we? What about a California Bowl? Spicy Salmon Bowl? Tempura Bowl? Imagine everything you love in your little bite sized sushi pieces doing the nae nae in our Signature Bowls or create your very own bowl with tuna, salmon, crab, avocado, cucumber, mangos, our signature spicy mayo, sweet wasabi aioli, or poke seasoning! Love KFC? No, not that KFC, we're talking about Korean Fried Chicken. We've taken that double fried technique to create the signature crunch to our very own wings. Fresh all natural chicken, hand-battered, and made to order. Served with our Soy Garlic or Spicy Honey sauce, homemade pickles, and our trio of dry rubs. 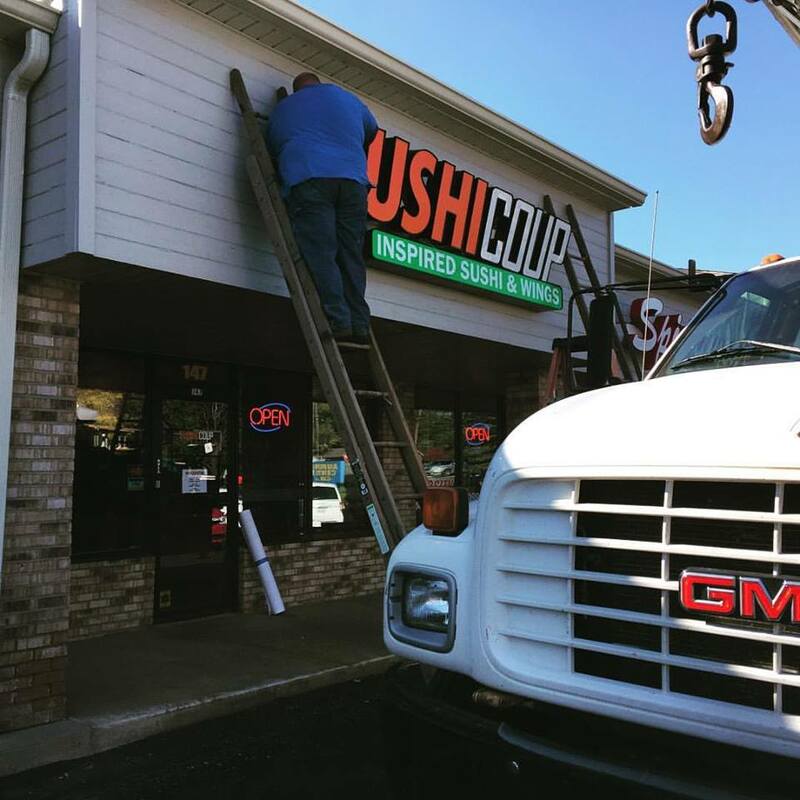 sushi "co up"? sushi "ku"? sushi "cup"? It's sushi "ko͞op". And what does that even mean? After weeks of trying to narrow down what we would name our little sushi and chicken wing baby, we ended up with 4 choices. None of them made the cut. Jokingly, I asked what if we named it "Sushi Coop". "Sushi" .......because obviously. And "coop", because chicken coop. Then I said what about "coup" like coup d'état (....you know, like the takeover). It was then that I learned I didn't know how to pronounce "coup d'état" properly, but there it was. Our little baby finally had a name. We wanted to let people we were going to have a sushi takeover and change what you think about what good sushi is. And at the same time, we wanted to have a little fun and pay homage to the chicken wings that we specialize in. And so, "Sushi Coup" was born.